When I received my first order from Sloyd, there was a little note in the box saying “Free gifts from our own series. Very different types of puzzles. Hope you’ll enjoy them!” along with a couple of additional puzzles – one of which was Vesa Timonen and Tomas Lindén’s Double Squared. I’d spotted it as one of the entries to the 2010 IPP Puzzle Design Competition and wasn’t sure if it would be my cup of tea or not, but since I’d just been given one, it would be rude not to play around with it at least a little, right? So the goal sounds reasonably simple: make square of white or black (OK brown!) – your choice. There’s another version that says “Arrange the six pieces (without any support) to make a white (or black) square.” There may be a subtle difference in there, and it might be useful, or it may be a total red herring, you’ll need to work that out yourself. It turns out that the pieces are helpfully provided with what I’d call (probably incorrectly – see the ensuing comments section below in due course!) a parity problem – there’s always one wrong shaped or coloured piece, and the only way to get around that is to get rather creative! The eventual solution is a real killer – you’re not going to stumble across this one by accident. It’s definitely worthy of an entry into the Puzzle Design Competition. Thanks Sloyd for the freebie! Like you I also recieved this from Oy Sloyd Ab and I have still not solved it. After spending a few minutes every day for the best part of a month I still could not find the solution so it's on the to do list now. A very good but frustrating puzzle. 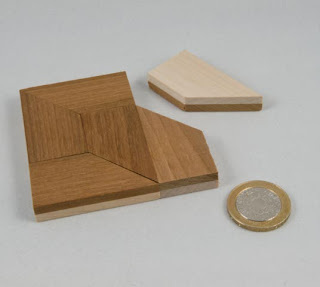 I was disappointed by this puzzle because (in my opinion) the solution is a stupid trick. It is always a bad sign when you see a "solution", and you have to go back to the problem statement to see how it could possibly be considered a solution. I'd like for anyone solving the puzzle to know that it's not a silhouette puzzle. I looked at the official solution after coming up with a solution which I though was a little bit outside the implied goal being a silhouette (and kind of a "stupid trick"), but that is not the right solution. 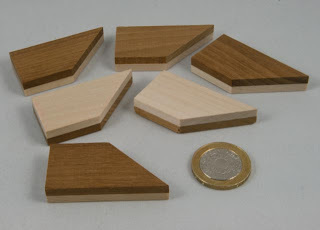 Looking at these pieces, I suspect that the solution is that you make a square using only 4 of the pieces! The long side looks twice the length of the short side. It doesn't say in the instructions that you have to use all the parts does it? Feel free to delete this if it is too much of a spoiler to appear on the blog! "Goal: Arrange the six pieces (without any support) to make a white (or black) square." Hmmm ... this seems to imply that the square is made from all six pieces, but I suppose one could argue otherwise. Nonetheless, your solution is not "the solution", which uses all six pieces. The clue phrase is "(without any support)". What the heck could that mean? Just took another quick look at this puzzle after reading George's comment. I think I've solved it although I won't post how here... an interesting solution to this little puzzle. A burr is a burr is a burr, or not! Six-piece burrs … Dipping my toes in a new pool.